Raw Cutz brings the creative sampling techniques of the past into the future, with a fresh blend of inspirational Hip Hop sounds and samples created using vintage techniques and equipment to bring you the authentic sound of the underground. 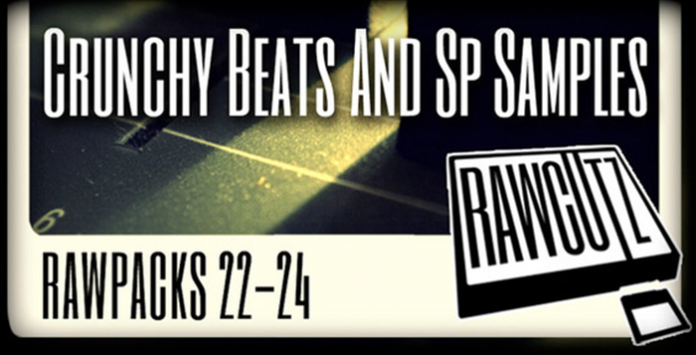 Rawpacks 22-24 is a cool collection of samples from SP12Hundred, an underground Hip Hop fanatic and master producer who learnt his trade in Brixton, UK after being inspired by Pete Rocks production techniques. This pack contains his second three packs for Raw Cutz – “Astro Blakk”, “Prestige”, and “Raw Slice”. Supreme is a smooth journey into the heart of this producers sonic palette. Featuring cheap chops, spliffed out sounds, jazzy bends, rhodes moments, echoing keys, glassy notes, flipside beats, soulful guitars, high strings, fat snares and deep kicks.Abstract is a smooth journey into the heart of this producers sonic palette. Featuring cheap chops, spliffed out sounds, jazzy bends, rhodes moments, echoing keys, glassy notes, flipside beats, soulful guitars, high strings, fat snares and deep kicks. Nu Forms from SP12Hundred, the funky, chunky jazz sample collection which fuses cool organic strings with movie themes, retro guitars, sharp hits and fat basses. Expect to find one shot chords, gritty saxes, cool jazz sonics, ambient pads, descending arps and fat snares. Abstract is the consummate collection of chronic keys, bruised beats and sonic madness which is interlaced with crushed chords, stabbing notes, one shot saxes, deep wurlis, delayed notes and light fx. Within this pack producers should expect to find 32 Hip Hop Breaks, 622 Inspirational Musical Samples, 75 Kick Drums, 44 Snare Drums, 28 Hi Hats, plus 32 Rex2 Samples. Rawcutz.com is the new hip hop sample label from the people behind Loopmasters and Equipped Music, responsible for titles including Smokers Delight, Premier Beats and Hip Hop Instrumentals – a fresh approach to providing you with the raw building blocks to create inspirational and original music. Included in each pack you will find a great selection of Kicks, Snares, Hats and inspirational one shot musical sounds that will inspire you to create new music from the dusty sounds of the past, all processed through vintage machines including the SP1200, MPC range and musical EQs and compressors.